In 1737, the Reverend Amos Main became the first settled pastor of the Congregational Church, located on Rochester Hill. The building would be moved to Rochester Common, which then encompassed 250 acres (1.0 km2) and was called Norway Plain Mille Common after its abundant Norway pines. At the time, the Common extended into what is now downtown Rochester. By 1738, the farming community contained 60 families. A statue of Parson Main, sculpted by Giuseppe Moretti, today presides over the town square. By 1780 the area surrounding the Common was the most thickly settled part of town, so a meeting house/church was erected on the east end of the Common with the entrance facing what is now South Main Street. A cemetery was also established near the new meeting house, but the ground was found to be too wet, and the bodies were removed to the Old Rochester Cemetery. 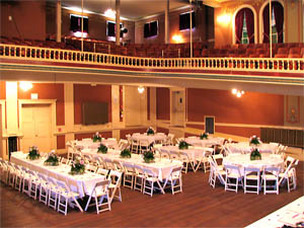 In 1842 the Meeting House/church was moved to the present-day location at the corner of Liberty and South Main streets. As the years went by, the size of the Common would shrink as more of it was sold off for development. A bandstand was constructed in 1914. Today, the Common is used for community activities such as Memorial Day events and for concerts throughout the summer months, in addition to having a walking track. During the Revolutionary War the Common was used as the meeting place for soldiers before going off to war. The common is also the location of the city's Civil War monument which bears the names of the 54 men who died then. The monument was dedicated in the 1870s, and in the 1880s the statue was added to the monument. Four Civil War cannons also decorated the monument, but during World War II the cannon were melted down for use in the war. They were replaced by World War II guns. 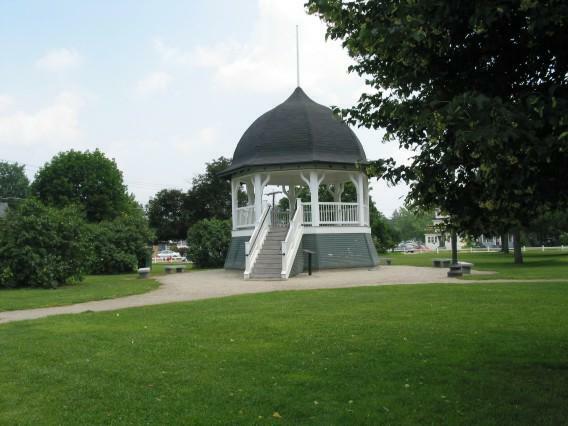 The bandstand was built in 1914 by Miles Dustin; before then band concerts were held on the square. The flag pole was donated by J. Frank Place in 1917. He was the former publisher of the Rochester Courier. Another notable structure is the 1908 Rochester City Hall and Opera House by George Gilman Adams. Adams designed other city hall/ opera house dual-purpose buildings around New England, including in the communities of Bellows Falls, Vermont (1887); Amesbury, Massachusetts (1887); Dover, New Hampshire (1891); and Derry, New Hampshire (1901). Only four of his city hall/ opera houses survive today (in Waterville, Montpelier, Derry, and Rochester) as many of his buildings were destroyed by fire. George Adams' opera houses were unique because of their floors which were movable and could function in an inclined position or level position. With the floor in the inclined position, the opera house would show plays and concerts. When the floor was level, the building could be used for dances or public meetings. Almost all Adams' buildings contained the movable floor, though the buildings in Waterville and Montpelier did not. 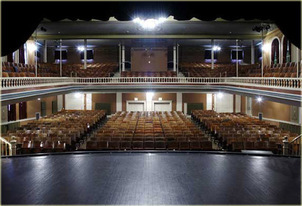 Because of the destruction of the other opera houses, the Rochester Opera House is the only known theater in the United States to use this type of movable floor. The Rochester Opera House opened on Memorial Day in 1908. The Rochester City Hall contained the Rochester Police Department in its basement offices for many years. Some historical portraits of officers remain in an upstairs chamber where a collection of portraits of city officials was traditionally preserved, including officers Nelson S. Hatch and Red Hayes. Today, visitors may still attend shows at the Rochester Opera House. The City of Rochester has preserved the 90 year historical decor of the Opera House. The library was approved in 1893 but was not open to the public until early 1894. Back then the library was located on the corner of Portland Street and South Main Street. In 1897 it moved to City Hall where it remained for over 8 years. 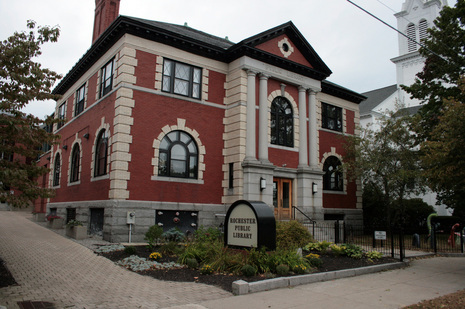 In the early 1900s, Rochester Postmaster Osman Warren contacted Andrew Carnegie to secure his help in providing financial help in building a new library. The Carnegie Institute responded with a check for $20,000. The brand new library was built on the site of what was the Main Street School. The library was built in the new Georgian revival style using brick and granite, and the inside was finished with golden oak and cypress. This 1880s brick and stone arch bridge is the centerpiece of the city's historic district. 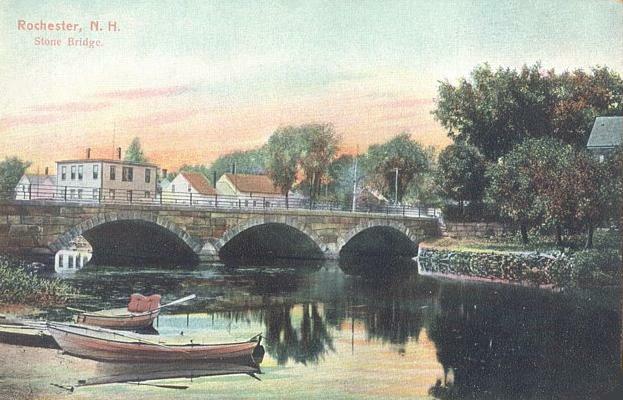 In 2011, Wyman & Simpson completed the reconstruction in coordination with the City of Rochester, New Hampshire Department of Transportation and New Hampshire Division of Historical Resources. The reconstruction preserved this historic structure and included extensive rehabilitation of the three-span stone arch bridge and placement of concrete sidewalks, aluminum bridge rail, masonry rehabilitation, sheet pile cofferdams, roadway drainage, excavation, gravel, paving, and fiber optic utility coordination.